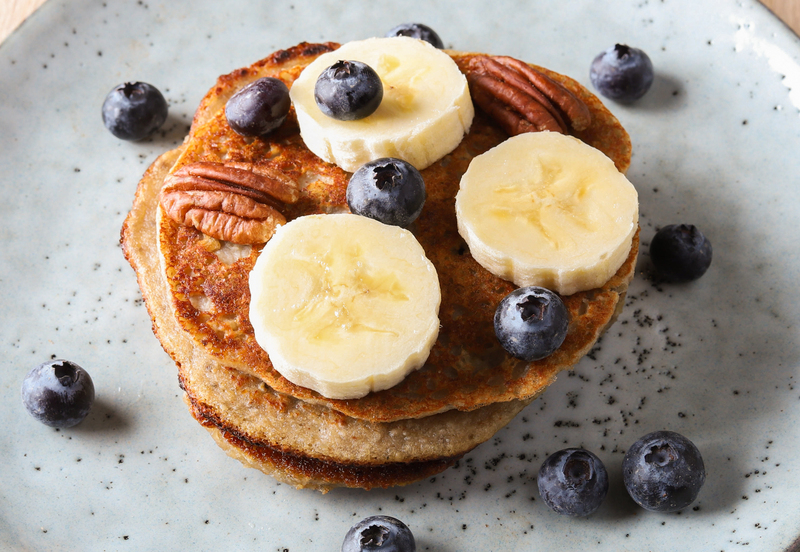 These fluffy banana oat pancakes are a deliciously healthy, naturally sweetened breakfast for lazy mornings! I like to add some nuts for extra crunchiness as well as a drop of maple syrup for extra smoothness ! Put in a food processor all the ingredients and mix them all until well combined. Heat a little coconut oil or olive oil in a pan. Once it is hot, drop some of the batter in the pan and spread it evenly with the back of a spoon. Turn the heat down to low. After a minute check the bottom of the pancake, it should be brown. Flip it over to cook the other side for another minute. Remove the pancake and put it on a plate. Add some fresh banana slices, drops of maple syrup , pecans and a handful of blueberries, enjoy!